Monday – Plan: Easy 4. Actual: Ran 4 miles, avg. pace 9:37. Tuesday – Plan: Hills on treadmill. Easy 15 minutes. Then 2 x 8-10 seconds hill sprints with 2 minute recovery in between. Actual: Ran as planned with hill sprints at 7% incline. For some reason I thought recovery was 2.5 min so I ended up having a longer recovery. Oh wells. Ended up with 4.01 miles on my Garmin, avg. pace 9:37. The treadmill had me at 4.11 miles. Wednesday – Plan: Rest day to recover from the half on Saturday. The miles weren’t too long, but the time on your feet was. Actual: Rest day. Love rest days since I can sleep in a little bit before I go to work. Thursday – Plan: 1 hour easy. Running Efficiency Workout- Do after run. Helps run form and efficiency. 1. Lateral Bounding. Do for 30 seconds. 2. Split Squat Jump -16 reps.
3. Single Leg Box Jumps. Start with a low step or box to assess how high you can safely do. Do for 20 seconds. Core-10 minutes at least. Pilates or other core workout video. Actual: Had a nice hour run, 6.41 miles, avg. pace 9:22. Then did the running efficiency exercises. Fun stuff. Afterwards, I did what I could from Ab Attack from Insanity Max:30.😜It’s a hard one and I had to rest some but I did what I could. Friday – Plan: You can sub this with Forest Park if you want to go there. If you go there- do 3 x uphill, 3 x downhill strides. 5 x 30 seconds fast/2:30 moderate-easy. Not a super slow recovery jog- try to keep it around moderate pace. This is called “float” recovery. Actual: I wasn’t able to go to Forest Park so I did the Fartlek. Felt pretty good and ended up with 6.01 miles, avg. pace 8:47. Saturday – Plan: Long run, 10 miles. Actual: Ran a nice 10.01 miles, avg. pace 9:07. Sunday – Plan: Rest day. Total miles = 30.44 miles. I thought it was a good week. Got all my workouts in and they went well. It’s only week 2, 18 more weeks to go. But it’s going to be a hot week ahead. A heat wave is coming to the PNW. The forecast has 100+ degree weather starting on Tuesday until Friday with a high of 109 on Thursday. Yikes! I’m wondering how hot it will be when I run those mornings. As for the rest of the week, I did a little biking with the kiddos. It’s always fun to get out and do something active with them. We also did a little geocaching. For those that don’t know, it’s like treasure hunting using GPS. The kiddos love it. On Saturday, we tried a new restaurant in the area, Frank’s Noodle House. The Portland location was on Food Network’s Diners Drive-Ins and Dives so we knew it was going to be good and it did not disappoint. The noodles are handmade and delicious. I can’t wait to try their other dishes. How’d your week go? Any races coming up? I’m linking up with HoHo Runs and MissSippiPiddlin for the Weekly Wrap. 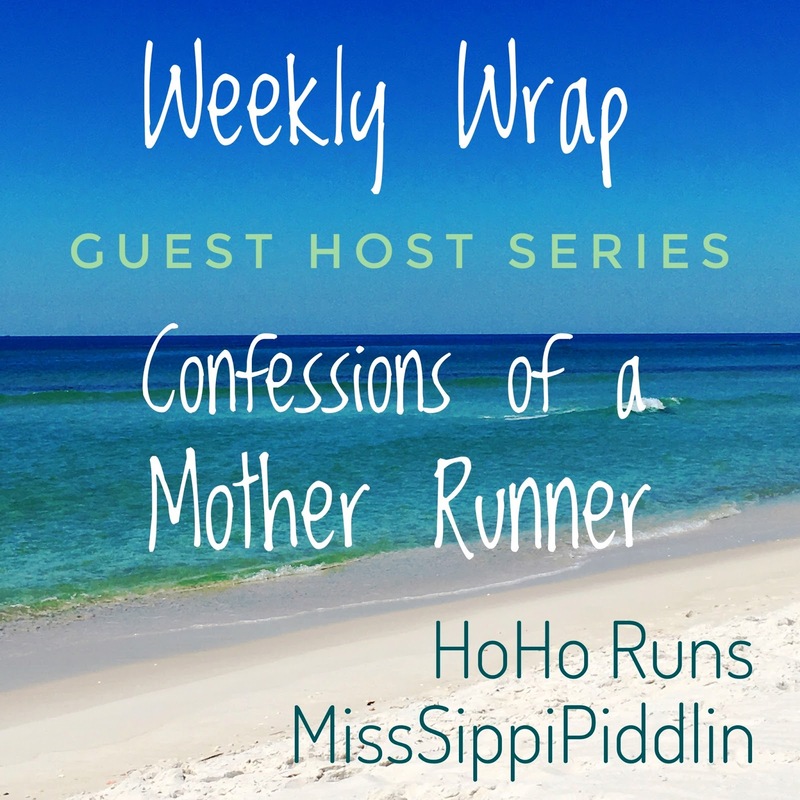 There’s a new Guest Host Series for the Weekly Wrap to give Holly and Tricia a break and this week’s host is Deborah @ Confessions of a Mother Runner. Love the photo from Frank’s Noodle House – that food looks yummy!! The food from the noodle house looks amazing!! I always love to find places that were featured on tv shows. It’s fun to go to them! This coming weekend I have double pacing assignments for 5k’s on Saturday. I’ll need to tack a few extra miles on to one of the runs. Thanks Sara! I’m glad we went and tried it out! Have fun next weekend! You are starting off training strong 🙂 It always feels a little crazy thinking 18 to go, but time flies! I just clicked on your link and saw your relive loop 🙂 I am going to read the recap now! It looked beautiful! Nice week! Those noodles look good! Way to get the kids out and goecache! We haven’t geocached in a while! I do remember reading about the HOT weather this week. Hope you are staying indoors. I love reading about your workouts every week because you always manage to get them done. Way to go!! Definitely sounds like a solid week! Be careful out there this week. Your son’s face . . . priceless!